Today is the stencil monoprint technique. This is where ink is added to the stencil itself. You can press with inks pads onto the back of a stencil, or use sprays, paints, stains, etc. Spray with water to activate the inks, then flip it over onto a piece of mixed media or watercolour paper. Press and blot with a paper towel or cloth to keep the open areas of the stencil free of colour. After the colour has been pressed into the card, you pull the stencil off and then blot one last time to absorb any excess diluted ink. 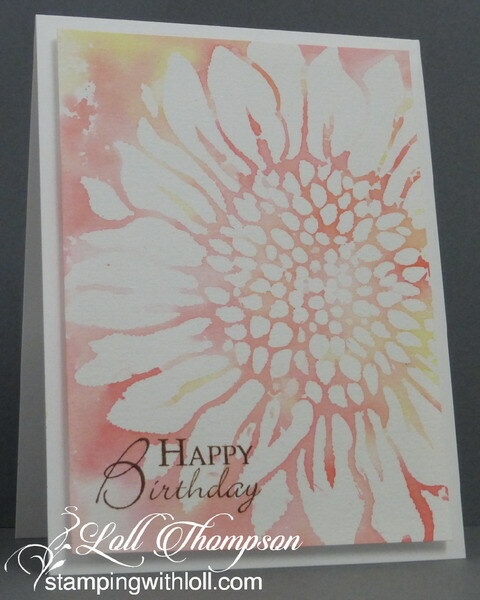 This is a way to colour the background of your card front, leaving the stencil image free of colour. My dear friend, Lee-Anne (Creatively LA) has a wonderful video tutorial on this technique. Click HERE to watch ... you'll be so glad you did as she explains the technique and shows a few different products that you can use. I used three colours of distress inks for my monoprint (squeezed lemonade, abandoned coral and worn lipstick), sprayed with water, pressed onto watercolour paper and ended up with this beautiful print. All that was added was a stamped sentiment in brown ink, which was clear heat embossed to make the colour a bit stronger. Easy and quick card to make. I used the same three inks, but must have sprayed more water as they blended and combined so you mostly see the coral colour. After it dried, I added the stencil back over top and lined it up with the image from the print. I spread a layer of embossing paste and let it dry. It adds a lot of depth and texture to the card front. This time I added a vellum banner with white heat embossed sentiment. Hard to photograph this card as it is so light ... but (hopefully) you can see the texture. Two ways to stencil monoprint, the first card using just the negative of the stencil ... and the second card using both the negative and positive. These are both absolutely glorious, Loll! I love the soft colors! Both versions are beautifully done my friend! Thanks for mentioning my tutorial :) Have a lovely weekend! WOW, WOW, WOW!!! These are both gorgeous, Loll! I love the coral colored background and stepping it up with embossing paste was brilliant! WOW! Both of these are gorgeous, Loll! I can definitely see the added texture on the second. Love that stencil! Both versions are all sorts of lovely but I adore the subtle texture added by the embossing paste. Beautiful makes, Loll! stunning! thank you very much for tutorials. I smiled when I saw this one! I KNOW if I saw one more beautiful card with that stencil I would not longer be able to resist getting it! Love the effects you achieved with stencil monoprinting. I'm intrigued by the color, one of my all time favorites, Adirondack Mountain Rose and you managed to get it by mixing distress inks! Love this, Loll! FAB-U-LOUS!! Love the colors, the stencil and the texture paste. What's next? Wonderful cards Loll - and wonderful to see your creativity with this one stencil - you are an inspiration. Love these colors combined and using paste on the second card takes monoprint technique to a whole different level....gotta try that! Two very striking and beautiful cards. it's hard to choose which is my fav so I've pinned both; thanx for the inspiration! Once again, you leave me breathless, Lol !! I love this dreamy background and these extra dimensions on the other card. Now I know that I used to buy the stencil! I love both cards. Both are marvellous, Loll! And they are your perfect colours! Great idea to add embossing paste to the positive of the stencil to add texture. Loll, love both of these. Its amazing the effect on the second card with the embossing paste. Looks fantastic in the photo and so soft and pretty in the first. I have never been into sunflower but you have really highlighted this stencil. Oh my gosh Loll, your stencil monoprint technique on both cards is absolutely beautiful! 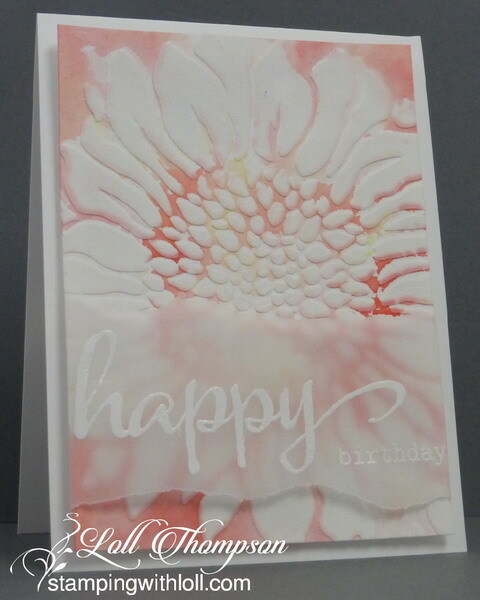 I love the soft coral peeking through the petals, and the dimension you created with your paste on the 2nd card is so dreamy! Such a striking stencil, too! Gorgeous cards!!! This is so pretty Loll and thanks for linking to the video! Hope you are enjoying the summer and keeping well. Oh, you are a master at getting the most out of your stencil, Loll!!!! Two cards that are soooooooo beautiful!!! Thanks for the link to the video - I'll definitely be watching it!!!! Too difficult to choose a fave of these two - both are wonderful!!! Oh my goodness. That stencil. And the wonders you have worked with it!